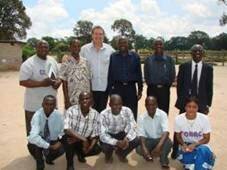 Back in 2001 Titus Mambwe attended a conference in Zambia sponsored by BHW. It was titled, “The Church Cares,” and we grappled with how churches in Africa could engage with the poor, especially those infected with and affected by HIV / AIDS. Titus was deeply challenged about the issues and went back to his home city to see what he could do. After a period of time he found himself involved in church leadership and youth work. This gave him the exposure and the opportunity. Leaders from his church and another in the Chiwempala community got together and formed an NGO called Chingola Orphanage and Aged Centre (CORAC) and registered it with the Zambian Government. The aims of CORAC are to demonstrate the love of Jesus Christ through the practical care of vulnerable and marginalised people, orphans, widows and those with disabilities and HIV/AIDS. In 2007 Titus contacted BHW and development of a partnership commenced. In early 2008 BHW staff visited the team and discussed the issues they were dealing with. It was clearly seen that a significant amount of research had been carried out and initiatives to respond to the issues had been commenced. Barnabus Mwelwa is the secretary of the organistion. He helps to run all aspects of the programme and is constantly looking for new ways to help the people of the community. Titus Mambwe. He has been involved in Christian youth work for a number of years in Chingola. The vision is clearly laid out and developed. The Board meets every month to oversee the various programmes that have commenced. They have registered the 35 most needy children and identified at least 180 others in the community who need help. Many of these children are going to school but are under constant threat of being removed for lack of payment of fees and lack of uniform. 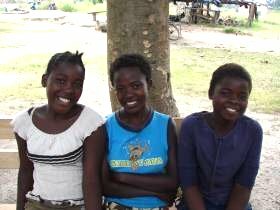 One of the main functions of their team is to advocate on behalf of the students for them to be allowed to stay in school. They are developing farming training and micro-loan programmes to empower families. On the 9 hectare farm the organisation owns they have been training and then letting out the land so they can oversee and disciple people as they grow the crops. The micro-loan programme is for farming inputs as well as small scale business programmes such as solar phone charging. 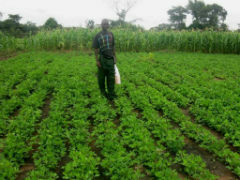 The farm also grows crops for use in the feeding programmes and produce for sale to help with the programmes. A small house has been built on the farm to accomodate people for training and working as the farm is 12km from town centre. The annual budget is split between education requirements, and farming and business training. Ethel is 24 years old and is completing grade 12 at school. She is mature beyond her years, struggling with her mother who she says does nothing. She was raised by her sister, who she painfully says has just recently passed away. “I loved my sister very much, she was my mum.” Ethel is now looking after her sister’s children – two sets of twins and a set of triplets – they all call her mum. Ethel looks after the 7 children of her sister and lives with her grandmother and an uncle. There are two other children living in the home as well, 12 in all. She says she needs to be a good mother, like her sister was to her. 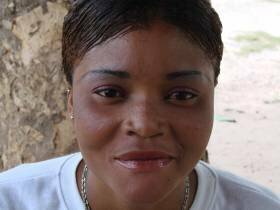 To earn money, Ethel goes to Lusaka, four hours away, and buys beautiful clothes of the latest fashion, which she then brings back and sells in Chingola. All of her nieces and nephews like to drink tea and eat bread, she says. They all like nshima (maize flour porridge) especially Jack. They have a big farm, where they grow maize, pumpkin leaves, sweet potatoes, tomatoes and cassava. Grace is seven years old and is a twin. Her mother passed away one month ago, and her father died just three months ago. She is in grade two and while she says her favourite thing is learning at school, she also says she just wants it to finish so she can go and play! Grace is an active and sociable little girl. She says she likes to pray, and she likes playing football. Rafiel is the other twin. He lives with his mother (that is actually Ethel above) only, but he says she does not do anything or go anywhere – she only does piece work. Rafiel is in grade one, he has just started school. He likes to learn, even though he started school late. He loves football and also likes to play with toys, especially cars. He enjoys going to church. “If it was not for CORAC I would have no help,” says Ethel. Although they have some land, they had no tools or understanding about how to grow food until the CORAC people helped. She is on the CORAC committee because it has been such a help to the family.